As you can imagine this is a terrine that fits all the classic Christmas flavours into one dish! I chose to make this as a way to get all the festive ingredients into one starter, to precede a more alternative main course. 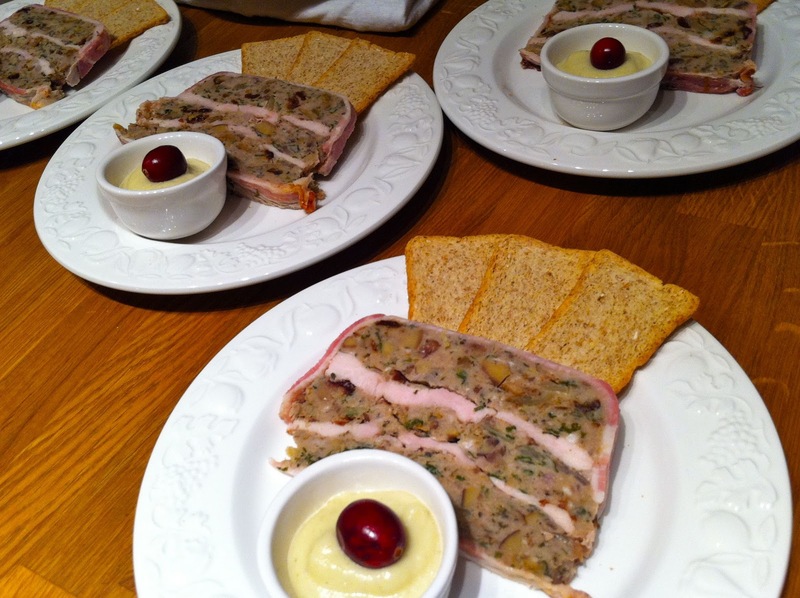 This terrine is packed with an assortment of Christmas tastes all in one mouthful, and can be made well in advance. Top tip: Always taste a little of the terrine mix before the packing stage, so you can get the seasoning and flavours just right. 1. Soak the dried mushrooms in the sherry for 10 minutes. 2. Meanwhile, dice and chop the onions, and sauté in the butter until softened. 3. Chop the chestnuts roughly. Remove the mushrooms from the sherry, keeping the liquid, and chop the mushrooms roughly. 4. Next make the terrine mix. In a large mixing bowl add the onions, sherry, mushrooms, thyme, parsley, chestnuts, lemon zest, dried cranberries and sausage meat and work together with your hands. Season well with salt and pepper. 5. To make up the terrine, grease a terrine tin (or small bread tin) and lay the bacon rashers overlapping each other to cover the bottom and sides of the tin. Allow the excess to overhang the sides of the tin - you'll need enough to fold over the top to seal the terrine. 6. Press approximately an inch thick layer of the terrine mix into the tin. Slice the turkey steaks into thin fillets and layer over the terrine mix, and with a pastry brush glaze with some of the cranberry sauce. 7. Repeat with a second layer of sausage meat and turkey as before finishing with a top layer of sausage meat. Fold the excess bacon over the to seal the terrine and press in a sprig of thyme for decoration. 8. Cover with buttered foil, and wrap the whole tin in a double layer of cling film. 9. Fill a roasting tray half way with boiling water, and place the wrapped terrine in the center. Roast the bath in a pre-heated oven at 180 degrees Celsius for one hour. 10. Remove from the oven and place a heavy object over the tin (I used my chopping board and granite mortar) - this compresses the terrine whilst it cools and compacts the layers. Allow to cool overnight. 11. When ready to serve, remove the wrapping and turn the terrine out of the tin. Remove any excess fat and slice into your desired portion size. Serve with melba toast and my Jerusalem Artichoke Pureé.